The VOLT is the world's most compact and versatile portable power solution. Its game-changing AC outlet delivers an incredible 85-watts. Now you can plug in and power devices like laptops and personal electronics as easily as charging your phone or tablet on the go. 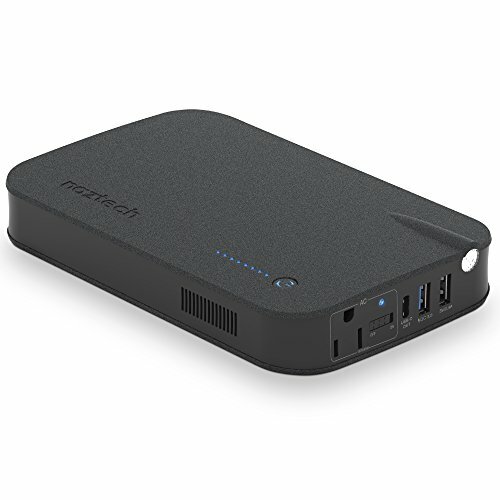 A massive 27000mAh capacity means there is more than enough power to share across the 3 additional high-speed USB ports. Redefine Mobile Power with the VOLT! ✔️MASSIVE BATTERY CAPACITY ALSO LIGHTWEIGHT AND DURABLE: The VOLT is engineered to pack the maximum amount of power in the most compact form possible. With a super-sized 27,000mAh capacity, there is more than enough power to charge even your most power-hungry devices for days with enough to share! ✔️UNIVERSAL AC WALL OUTLET: The VOLT's 85W output can power personal electronics that you've never been able to use with a portable battery before including laptops, electric fans, flat irons and electric razors. ✔️MADE FOR USB-C DEVICES:The VOLT delivers an incredible 5V/3A output to charge and power compatible devices that feature the new USB Type-C standard port including the new Samsung Galaxy S8 and S8+, MacBook, ChromeBook Pixel, HP Spectre, LG G5, HTC 10 and more. ✔️INTELLIQ TECHNOLOGY: The VOLT is engineered with Auto Device Recognition. Smart Chips detect each device's power needs and automatically adjust the power flow for the fastest and most efficient charging experience possible. If you have any questions about this product by Naztech, contact us by completing and submitting the form below. If you are looking for a specif part number, please include it with your message.